Creates a trimmed curve from the basis curve C limited between U1 and U2.
. U1 can be greater or lower than U2. . The returned curve is oriented from U1 to U2. . If the basis curve C is periodic there is an ambiguity because two parts are available. In this case by default the trimmed curve has the same orientation as the basis curve (Sense = True). If Sense = False then the orientation of the trimmed curve is opposite to the orientation of the basis curve C. If the curve is closed but not periodic it is not possible to keep the part of the curve including the junction point (except if the junction point is at the beginning or at the end of the trimmed curve) because you could lose the fundamental characteristics of the basis curve which are used for example to compute the derivatives of the trimmed curve. So for a closed curve the rules are the same as for a open curve. Warnings : In this package the entities are not shared. 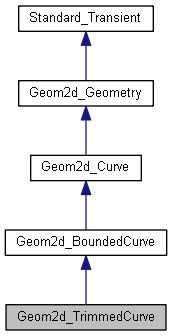 The TrimmedCurve is built with a copy of the curve C. So when C is modified the TrimmedCurve is not modified Warnings : If is periodic and <theAdjustPeriodic> is True, parametrics bounds of the TrimmedCurve, can be different to [<U1>;<U2>}, if <U1> or <U2> are not in the principal period. Include : For more explanation see the scheme given with this class. Raises ConstructionError the C is not periodic and U1 or U2 are out of the bounds of C. Raised if U1 = U2. Returns the global continuity of the basis curve of this trimmed curve. C0 : only geometric continuity, C1 : continuity of the first derivative all along the Curve, C2 : continuity of the second derivative all along the Curve, C3 : continuity of the third derivative all along the Curve, CN : the order of continuity is infinite. Creates a new object, which is a copy of this trimmed curve. For the point of parameter U of this trimmed curve, computes the vector corresponding to the Nth derivative. Warning The returned derivative vector has the same orientation as the derivative vector of the basis curve, even if the trimmed curve does not have the same orientation as the basis curve. Exceptions Standard_RangeError if N is less than 1. geometric transformations. — Purpose Returns True if the order of continuity of the trimmed curve is N. A trimmed curve is at least "C0" continuous. Warnings : The continuity of the trimmed curve can be greater than the continuity of the basis curve because you consider only a part of the basis curve. Raised if N < 0. Returns the parameter on the reversed curve for the point of parameter U on <me>. Returns the start point of <me>. This point is the evaluation of the curve from the "FirstParameter". value and derivatives Warnings : The returned derivatives have the same orientation as the derivatives of the basis curve.